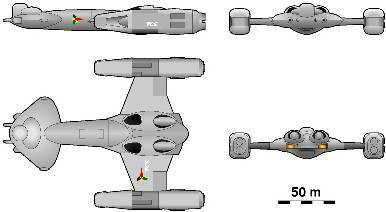 The first Klingon warships powered by matter/antimatter (M/AM) reactors were the ships of the D3 class, introduced from 2183. These ships were based on the earlier fusion-powered D2, but had their "necks" and "shoulders" lengthened to accommodate the new reactor and to provide additional space for fuel storage. The similarity of the Klingons' first-generation reactor to early Earth reactors suggests that Klingon engineers closely studied Earth designs. By the mid-2170s, M/AM reactors had become standard for merchant vessels within the UFP, so the Klingons would have had little trouble acquiring and reverse engineering M/AM reactors.